A single flute replaceable tip worktop cutter. 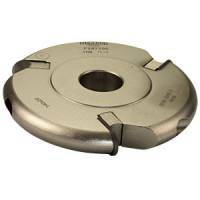 The relieved neck allows cuts of up to 58mm in a series of passes. The turnover blades have two cutting edges, making the tool more economical in daily use. The cutter is supplied complete with a knife and torx key. Select items from this list then seach on part number to locate in the spare parts list.